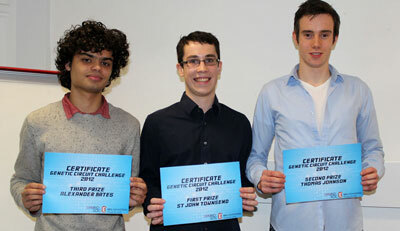 (Nanowerk News) University College London (UCL)’s SynBioSoc announced the winner of their 2012 Genetic Circuit Challenge, an engineering design competition using life science ‘ingredients’ and sponsored by UCL Engineering. StJohn Townsend, a Genetics MSc second year undergraduate, won the first prize of an Amazon Kindle Fire with a proposal for a gene therapy project to cure the rare neurological disease primary erythromelalgia, which causes painful limb inflammation. The Genetic Circuit Challenge is a synthetic biology design competition for students held over the Christmas holidays. Each student submitted a hypothetical design for a novel DNA system based on standardized genetic parts, accompanied by a description and ideas for mathematical modelling of their concept and accompanying ethical, legal and social issues. The circuits were considered by a panel including Dr. Darren Nesbeth, supervisor of UCL iGEM; Thomas Folliard, a current UCL Synthetic Biology MRes student; and Howard Boland, a Synthetic Biology artist at the London-based C-LAB arts and science collective. Judges praised the depth of research and the clarity of presentation. “StJohn’s circuit was a highly ambitious and fascinating proposal.” added Dr. Darren Nesbeth, one of the judges. Runners-up were Thomas Johnson, third year Biochemical Engineering student, who developed a carbon monoxide detection system and first year Neuroscience student Alexander Bates, who proposed a system of bacteria to automatically dispense nutrients for pets. The runner-ups were awarded book tokens and all participants recieved a certificate. Prizes were sponsored by UCL Engineering, as part of their commitment to encourage multidisciplinary, student-led projects. The winning circuits can be seen at www.synbiosoc.org/gcc.